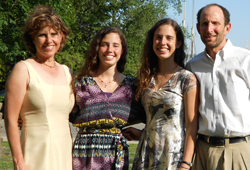 With a family history of generosity and a strong commitment to our Jewish community, Steve "Rosy" Rosenberg, Ellen Lippman and their family are teaching through their actions the greatest of our Jewish values, the value of justice through tzedakah. "While we consider it both an obligation and honor to support the Jewish community in Portland, Israel and around the world, our reasons for using OJCF donor advised funds are simply more selfish, rational and economical. We have been very fortunate to have accumulated appreciated real estate and securities investments which make ideal donation vehicles through the great tax savings that can occur," said Ellen. "While these assets could be given directly to the charities, donor advised funds allow us to give when the economics and timing of the donation are right. Then, we can watch the funds grow and give them later to the institutions most dear to us," said Steve. "Sometimes the timing or complexity of our donated assets make it difficult for public foundations to accept these investments. However, OJCF and their knowledgeable staff have shown great understanding, sophistication and flexibility. Thank you, OJCF, for helping us achieve our charitable and tax goals." OJCF is honored to have Rosy, Ellen and their family as a part of the Foundation family. Thanks to their generosity, numerous organizations and individual lives in Jewish Oregon and overseas have been improved.